Red now open feather flag has the text “Open” running down the majority of the flag. The top has the text “NOW” horizontally. It is our most popular now open feather flag design. The banner flag is about 12ft high by 2.5ft wide. It stands 14ft tall and flutters in the wind for easy visibility by potential customers. These flags are made for long term outdoor use. Be sure to take inside during high winds or other severe weather. This is a must have for any businesses’ grand opening. 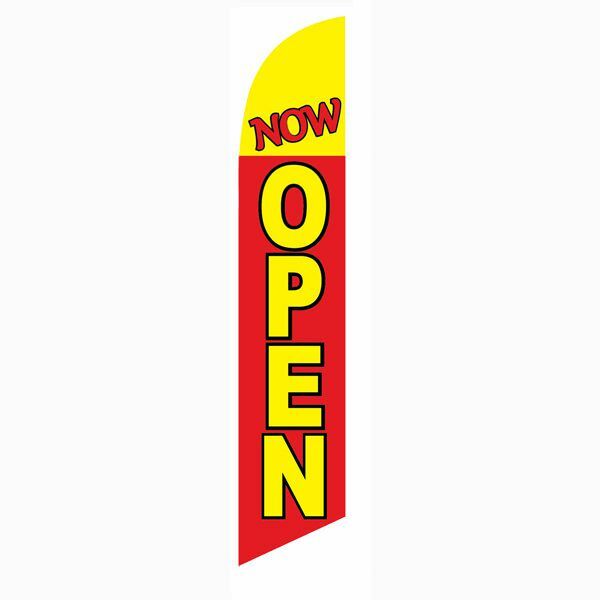 Our grand opening air dancers also pair extremely well with these open flags. 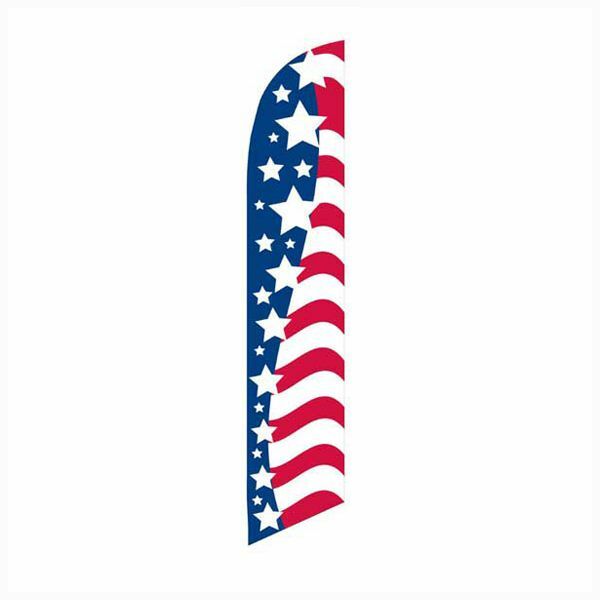 We also have this style open flag design in a light blue and black color combination. 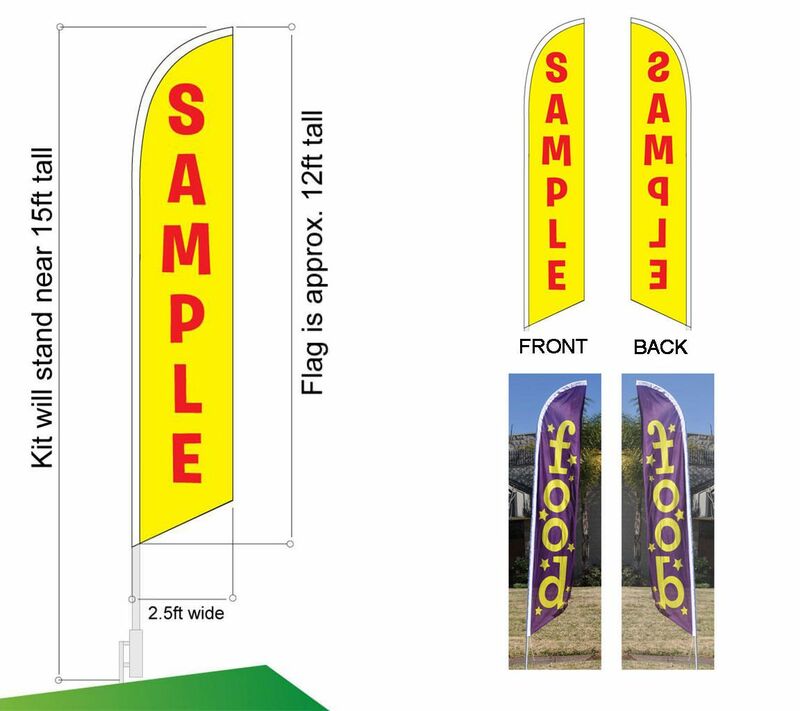 If you are looking for larger flag, we also have 3ft x 10ft open rectangle flags. Remember, orders over $100 qualify for free shipping. Use coupon code FREESHIP. What is required to have a complete open flag kit? 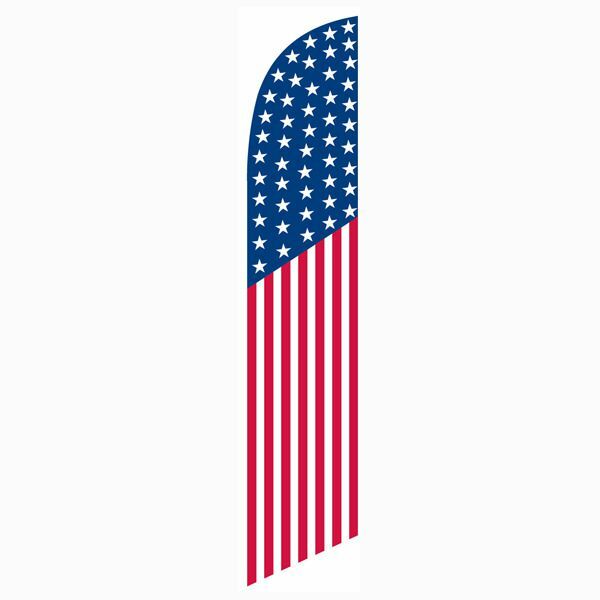 To use this flag vertically, you will need a flag, flag pole, and your choice of mounting hardware. Ground spike and cross-base are the most common mounts. Both can be added from the drop down menu. 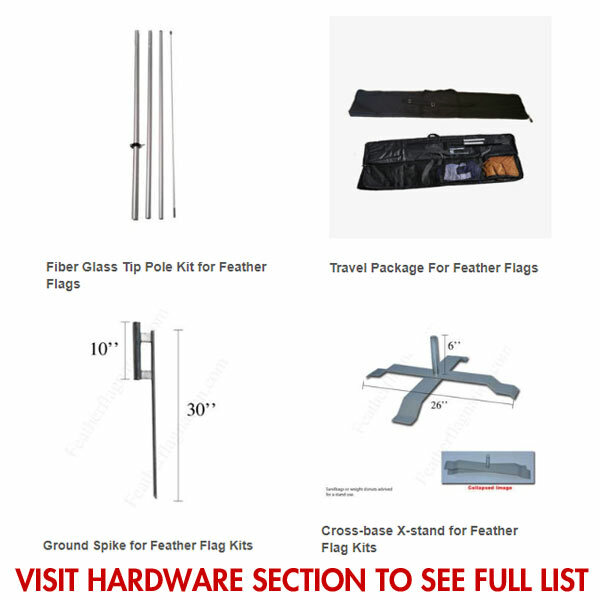 We have a huge section of feather flag hardware for you to choose from. Can I get a custom open flag? Yes, we can customize this feather flag or create a new one from scratch. Custom feather flags come in a variety of sizes. 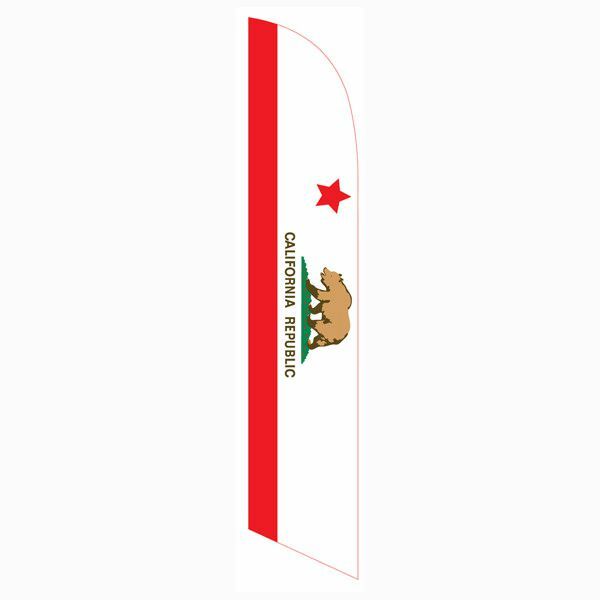 Our 15ft custom banner flag kit will match this stock flag. What material is this flag made of? Our stock flags are made of a polyester 4oz material. (120 GSM). This is a thorough tested material and is made for indoor and outdoor use. Is this banner flag double-sided? All of our stock flag prints (unless noted otherwise) are single-sided reversed back. This means the back of the flag will have a mirror image of the graphics on the front. Please refer to the image on the right. What other custom flags do you have available for me to advertise my business? We have a huge variety of custom flags for you to choose from. 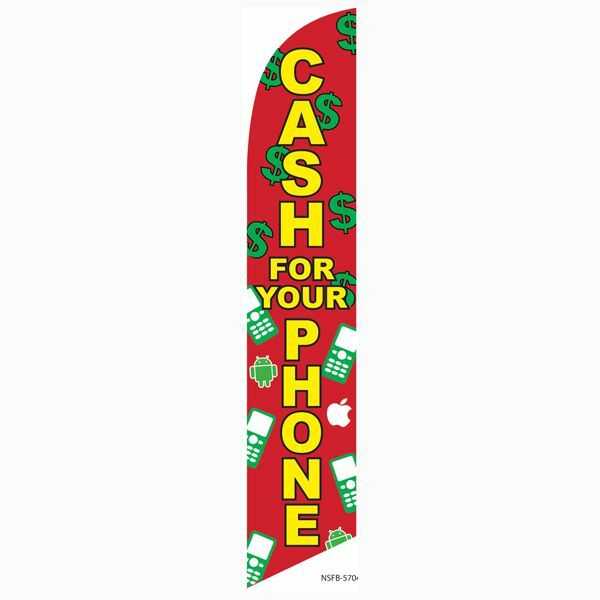 Our most popular would be our custom feather flags, teardrop flags, rectangle flags, and banner flags. How long will this now open feather flag last? If you plan to use it outdoors every day, you are looking to replace this flag within 9 to 12 months. We have many other cheap feather flags for you to choose from for only $14.99. These banner flags can easily be replaced. Premium poles have a stronger finish and the joints are reinforced. They are recommended for windy areas. Please note that you should still take your feather flag kits indoors during severe weather or high winds. If you select this upgrade, you will receive a travel bag and your pole kits and mounts will be upgraded to fit neatly into it. This is a great option, if you plan to travel. It is not needed for single location use. Required Flagpole Size: 14′ (Telescoped), will contain 3 straight pole pieces and one curved aluminum or a flexible tip piece. A pole can be added from the drop down menu. Total assembled height with feather flag, pole, and stake would be roughly 15ft. You can reduce the height by about a foot by putting the ground spike fully into the ground. Q is this on one side print or both side printed? A This is a single-sided reverse back now open flag. Due to ink bleed through, the back will be a mirrored image of the front. A Unfortunately, our stock flag banners only come as shown in the image. A Unfortunately, we cannot. Flag banners are as you see them. A Our stock swooper flags come as you see them. We are not able to change the sleeve or print sides, unless you do a custom feather flag order which does increase the price.